Why is the Cellphone Ringing ? You probably have a Guest at Home. Why Is Your Cellphone Ringing ? Because there's a visitor at your home who just rang the doorbell. This is no hypothetical situation but a real one. Waleli has launched a new product called "GSM Doorbell" that links that doorbell in your home to your mobile phone anywhere in the world. As soon as a guest rings the bell, you will get to know via your cell phone. You can also talk to the caller and even unlock the door to let the visitor enter your house. All this via GSM mobile phones while you are thousands of miles away from the home. The GSM Doorbell looks like any other doorbell you might find on a house. When a caller pushes the GSM Doorbell, it rings the resident’s mobile phone via the international GSM network. The visitor can talk to the resident via the small intercom panel next to the bell push. 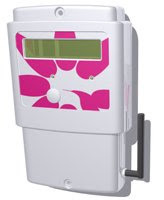 The GSM doorbell can also be linked to an electronic door release, allowing the resident to unlock the front door from the mobile phone keypad, using a secret code. With the GSM doorbell there is no more missing deliveries or rushing home to open the door when an authorized person pays an unexpected visit.